If you’ve been following along with the blog for awhile, you may remember the first edition of Look for Less that I shared back in September - it feels like forever ago! I think it’s high time for another one, don’t you think? Let’s officially make this a semi-regular series! You can probably guess what’ll this post is all about, but as a quick intro/refresher, I’ll be sharing two lookalike products: one that falls into the more budget-friendly category and one that’s a bit more of a splurge (though the ones I’ll be sharing are still quite reasonably priced!). One isn’t necessarily better than the other - they’re just different! Price does often correlate to quality, so bear that in mind as you’re comparing the high version to the low, but it’s ultimately up to you where you’d like to spend your hard-earned dollars. I’ve got some really great furniture and decor finds for you today, so let’s go ahead and jump right in! I’ve had my eye on a channel bed for awhile now - what do you think of this as an alternative to traditional button tufting? What I like about channel tufting is that it’s slightly more unique, and feels both modern and sophisticated. This style would look equally at home in a bedroom that’s more on the glam side or one that has a modern eclectic style. 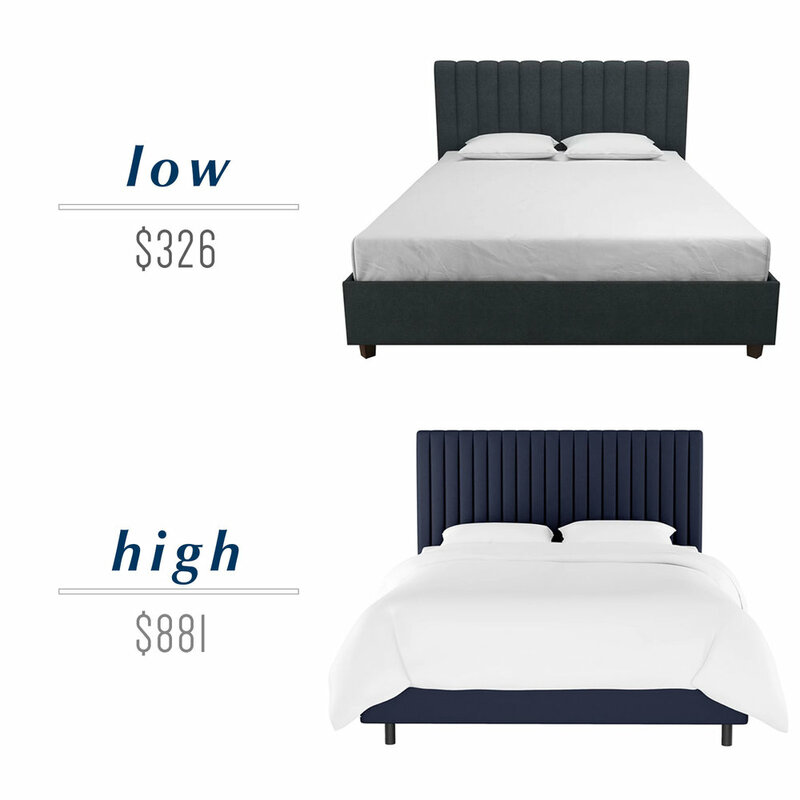 The differences between the two are that the “low” option has a lower profile, slightly wider tufts, and just three velvet fabric options (but they are great ones - navy, dark green, and gray). The “high” version has 15 fabric options and a slightly more grand look to it. It’s hard to go wrong with either, but for the record, I’ve heard some really good things about the budget friendly option from a couple of bloggers who have used it in their homes or projects! I really like both of these wingback gliders and ottomans. I’ve got nursery planning on the mind so we’re thinking through whether one of these is a good fit for our own house! The budget-friendly option is a pretty incredible deal and has great reviews. It also comes with the ottoman pictured, which is awesome. The higher priced option also offers an ottoman, but it has to be purchased separately. The advantage of going with that one though is that it comes in a ton of fabric options, so if you’re looking for something other than ivory or gray, it may be worth it to spend a little more to get what you want. X-base ottomans are a great way to add a little bit of extra seating without taking up a lot of room. They’re super functional and come in a lot of different styles and looks. These two happen to be wicker, but I’ve seen them in fully upholstered versions, with fabric seats and metal or wood legs, and in leather. There’s one for just about every style! My favorite places to use these are in a living room by a fireplace, at the foot of a bed (use two or three! ), and under a console table. The wicker ones I picked out today have similar vibes, but come in at very different price points. The budget-friendly one has a simpler design and comes in a medium-toned wicker while the higher end one has more texture and interest, and comes in a lighter shade. If you’re looking to save on this particular accent piece of furniture, the lower priced one is a great option and will give you a similar vibe to the more expensive one. I do love the seat on the higher priced one though - it might be worth the splurge! There’s nothing like a touch of brass to give a piece of furniture a touch of high-end style, is there? I think it’s a great alternative to wood legs if you want something a little different. These two sofas have similar lines and are nice and long, but not too deep. They’ll fit three people comfortably and four if you want to get cozy! The seat cushions are slightly different shapes - one has “T” cushions and the other has straight bench cushions. One isn’t better than the other, but they are different looks. The high version also has a ton of different fabrics and colors to choose from whereas the budget-friendly version only has two velvets. BUT, be sure to take a look through the other fabric options on the more expensive sofa because some of them come in at just a bit more than the price of the other sofa. Mirrors are such versatile pieces of decor. You can use them in so many places in your home - above your dresser, bathroom vanity, or any piece of furniture really! You can also hang them on their own to fill a spot on a wall. These carved wood beauties almost act like pieces of art and the intricate detailing makes them extra eye-catching too. 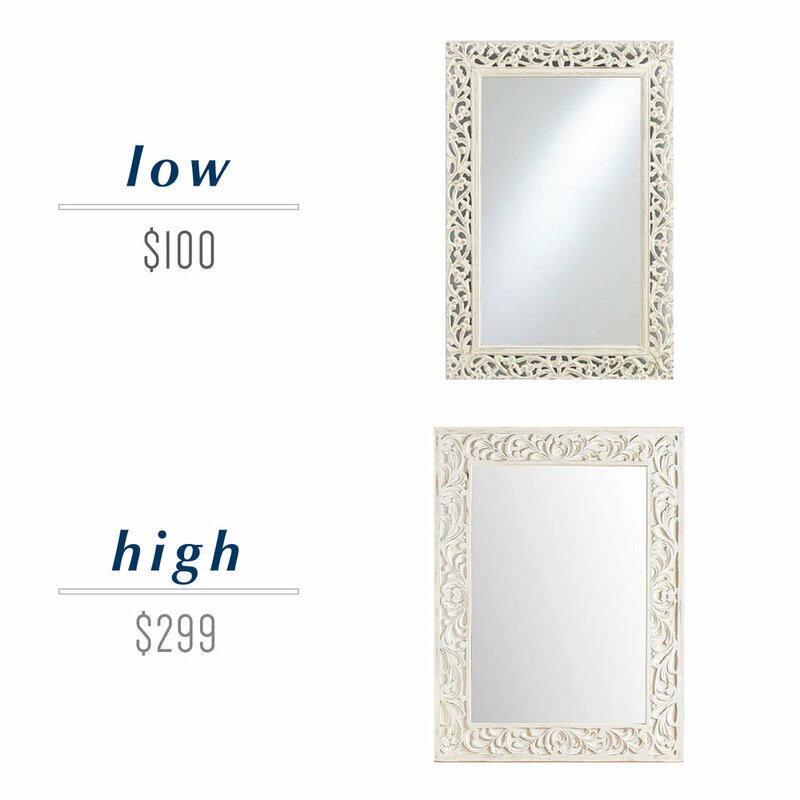 The budget friendly mirror option is a steal at $100 for a 24”x36” size, which would be fabulous as a bathroom mirror. The larger one, though more expensive, is actually quite reasonable for the large size (30”x40”) at $299. Both have a slightly distressed look that would work well in a coastal, bohemian, or eclectic style home.